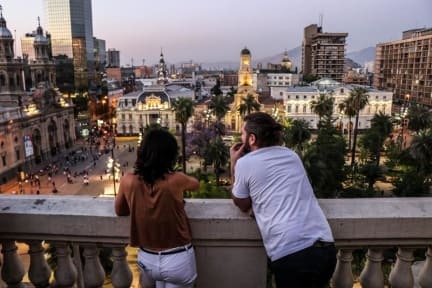 Located in the central square of Santiago, Plaza de Armas Hostel is on the 6th floor of the historical listed building 'Portal Fernandez Concha'. With bilingual 24 hour receptionists, fast wi-fi everywhere, spacious lounge / lobby, board games, video games, smart TV, coffee and coffee 24 hours, overlooking the epic view and the BBQ and the telephone of this week. Click here to see Santiago's profile. 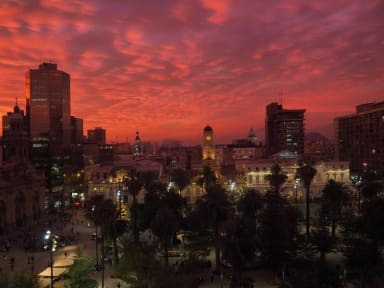 We are located in the front of the Plaza de Armas, edicción is on the opposite side of the tower tower building, gran edigo old fills with fast food restaurants not level, access to the residential entrance with the number 960, no 6th floor , number 607. Amazing. Hotel and hostel combined. This hostel is in the MOST perfect location in town! The staff including Angel were so helpful with everything and the breakfast is awesome. Highly recommend. Good and happy staying this place. This hostel was easily one of the best I have staying in over the past few years. The location is unreal, literally right in the centre of the city on the top floor/roof top. So many common areas and hangout spots, awesome people. Rooms and bathrooms are a little tight but not an issue at all. Breakfast was dope. Excellent location right in the centre. Great views, great breakfast, quite a busy and socialble hostel. A lot of restaurants arround,and very short distance to the metro station. Great location and terrace. Good breakfast. Showers were absolutely freezing every day! The area is not safe after sunset! My room was between the lobby and the kitchen, the rooms have sliding glass doors so you can hear everything until about midnight, including street noise. When I tried getting my towel deposit back he said it wasn’t in the system and asked how much I paid. I couldn’t remember and he told me they have 3 different types of towel deposits and I should keep better track of my money! I never got it back. Also, you share the building with what appeared to be street hookers and their clients. ENJOY!